Since the natural hair movement has taken off I have been loving the various hair scarves, ornaments, and jewelry that curlies have been embellishing their crowns with. 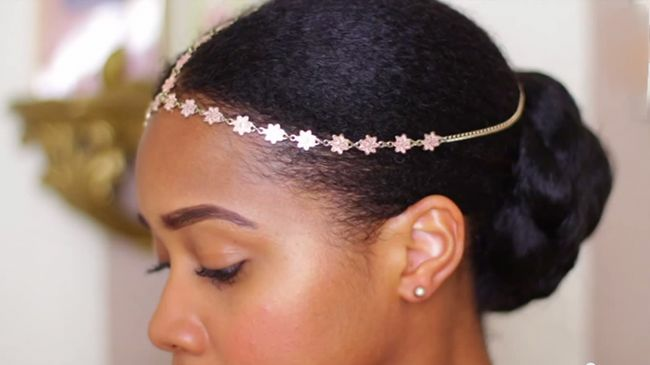 If you want to dress up a look or add some flair to a last minute style, try wearing hair jewelry. It is perfect for the spring and summer, especially if you love the bohemian aesthetic, as it pairs flawlessly with lace and floral. Before upgrading your styles, here are some tips to save your jewelry and hair from a tangled, matted nightmare. Whatever you do wait until you hair is completely dry before assembling your jewelry. Allowing your hair to dry completely will prevent any shrinkage around the accessory, which will make it more challenging to remove. Also, in order to prevent tarnishing or rust, wait until you hair is completely dry so that you do not ruin the jewelry. In the event that you will be outdoors or riding in the car with the window down, you want to protect your jewelry from getting entangled in your hair. Use bobby pins or make sure the hair accessory is securely fastened in the hair. The last thing you want is an unplanned big chop. You will notice Mini Marley do this in the video below. If I can barely keep my scarf and bonnet in place overnight, then I know that hair jewelry will likely snap my hair as I toss and turn in my sleep. If you want to maintain your sleek style, simply spritz your hair, add a dab of your favorite styler, and secure with a satin scarf so that is sets overnight. Watch Mini Marley create different looks using hair jewelry from Forever 21.